The principal gases used in the industries far and wide are nitrogen, oxygen, carbon dioxide, argon, hydrogen, helium and acetylene with the nomenclature of industrial gases which are often called as specialty chemicals too. To the greatest extent, gaseous substances are compressed in gas canisters, cylinders, tube trailers etc. However few gases are vapors that can be liquefied at ambient temperatures under pressure and some gases which are unstable and explosive are mixed with some other substances and stored as a packing mass in cylinders. Oxygen is the most common element in the earth’s crust and the second largest industrial gas. Oxygen at elevated levels becomes a fire risk (normal levels at 20.9% volume), increase in the oxygen levels in the air to 24% can create a dangerous situation where it becomes easier to start a fire, which will then burn hotter and more fiercely than in normal air; it may be almost impossible to put the fire out. Oxygen is also very reactive: pure oxygen, at high pressure such as from a cylinder, can react violently with common materials, including textiles, rubber, metals, oil and grease. 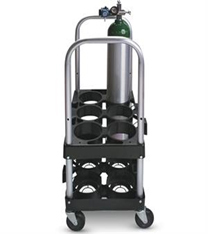 Oxygen tanks containing pressures up to 200 bar (3000psi) are used for industrial purposes, whereas 2150 liters of oxygen weighs about 3 kg. Liquid oxygen in a Cryogenic Storage Dewar (vacuum-insulated flask) is used in aerospace, submarine and gas industries. Liquid oxygen has a pale blue color and is strongly paramagnetic; has a density of 1.141g/cm3 and is cryogenic with a freezing point of 54.36K( -218.79° C; -361.82° F) and a boiling point of 90.19K ( -182.98°C;-297.33°F) at 101.325 kPa. 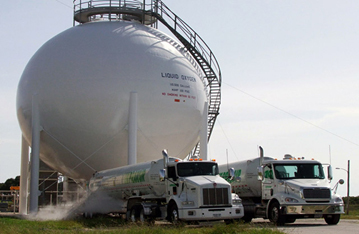 Liquid oxygen has an expansion ratio of 1:861 under 1 standard atmosphere (100kPa) and 20°C (68°F). Because of its cryogenic nature, liquid oxygen can cause the materials it touches to become extremely brittle. Liquid oxygen is also a very powerful oxidizing agent: organic materials will burn rapidly and energetically in liquid oxygen. Further, if soaked in liquid oxygen, some materials such as coal briquettes, carbon black, etc., can detonate unpredictably from sources of ignition such as flames, sparks or impact from light blows. Control and mitigation techniques for oxygen include the control of the release, e.g. through engineering controls; respiratory protective equipment (RPE); provision of suitable ventilation; appropriate storage tanks, gas cabinets and cylinders. Compressed oxygen gas cylinders must be stored in areas with ambient temperatures not exceeding 52°C. Indoor storage should be separated from the remainder of the building by a fire separation or non-combustible barrier at least 5 feet high (1.5m), 18 inches above the tallest cylinder having a 2-hr fire resistance rating; the doors should be equipped with self-closing and latching devices, dry location, at least 20 feet (6.1m) from highly combustible materials such as oil or excelsior, and definitely assigned places away from elevators, stairs, or gangways. Where cylinders are stored outdoors, shall be supported on raised concrete or other noncombustible platforms, a non combustible canopy in an enclosure surrounded by a firmly anchored fence and used for the sole purpose of such storage. Storage rooms shall have exterior signs with minimum 50mm high letters indicating the nature of the compressed gases.